Home AP JOBs AP State JOBS Railway Recruitment Board RRB TG State TS JOBs RRB Group D Posts Recruitment 2018 Online Application form, How To Apply? 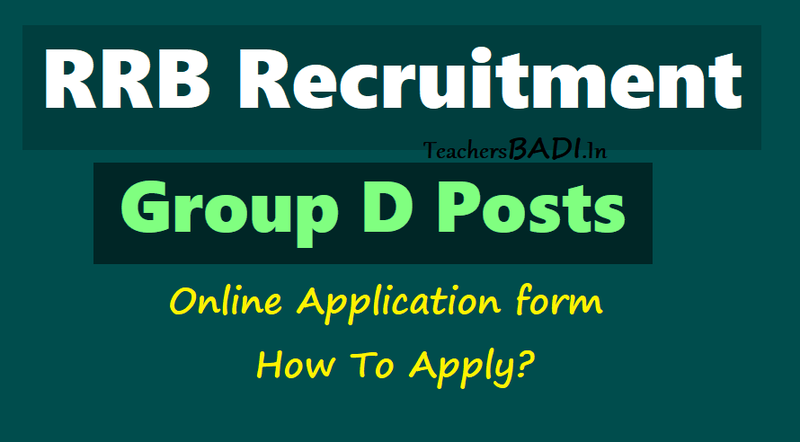 RRB Group D Posts Recruitment 2018 Online Application form, How To Apply? RRB Recruitment 2018 for 62,907 Group D posts released: Check how to apply, eligibility, important dates here. Railway Recruitment Board, RRB has invited applications for filling up 62,907 vacancies in the railways under Group D via its Centralized Employment Notification, CEN 02/2018. The registration for the railways Group D positions would start from February 10, 2018 and close on March 12, 2018, at 23:59 Hrs.. Candidates interested in railways recruitment can fill register on the official website of respective Regional RRBs. The details of the vacancy, eligibility criteria, age limit, selection process and pay scale are provided below. Steps on how to apply are also provided below. 1. The last date to apply has been revised from March 12, 2018, to March 31, 2018. 2. Signatures of the candidates on all documents should be identical in all stages of the recruitment process and should not be in block/capital letters. Signatures in a different style at the time of CBT, PET and DV etc., may result in cancellation of candidature. 3. Also, following the announcement from Railway Minister, the candidates across all regional RRBs have the option of appearing in the examination in a regional language. Candidates can choose from Assamese, Bengali, Gujarati, Hindi, Kannada, Konkani, Malayalam, Manipuri, Marathi, Odia, Punjabi, Tamil, Telugu, Urdu language as a medium of examination. 4. Also, the age limit has been extended by 2 years across categories. The revised age limit for CEN 02/2018 is now read as 18 – 33 years for the unreserved category as against the previous 18 – 31 years. This is applicable to extensions to the reserved categories as well. The new age limit for CEN 02/2018 is provided. The applicant must possess a passing certificate of Class 10th or ITI from institutions recognized by NCVT/SCVT or equivalent or holding National Apprenticeship Certificate (NAC) granted by NCVT. The applicant must fall in the age bracket of 18 to 33 years as on 1st July 2018. Age-relaxation is applicable as per government rules. Application fee can be paid online and offline both. Candidates will be shortlisted via Computer Based Test (CBT). Qualified candidates will undergo Physical Efficiency Test (PET). Marks of CBT will be normalized. Before applying, all candidates are advised to carefully go through the detailed centralised employment notification or CEN. The notification number for Group D posts is CEN 02/2018. Direct link to the detailed notification is also given below. Candidates should check the list of detailed vacancies in various RRBs to match the vacancy to their respective qualification in that RRB before applying. Candidates can check the vacancy available in various RRBs on the link provided below. Please note, once the RRB has been selected and registration is completed, change of RRB will not be permitted under any circumstances. Also, candidates should ensure that they have all the required documents ready before starting the online application. The list of documents required is given below. 2. Category or SC/ST Certificate for candidates seeking a free travel pass for the purpose of examination. Please note, general category candidates would not be provided with this facility. The category certificate should be in JPEG image format of size 50 to 100 KB. PDF document is not to be uploaded. 3. For candidates desirous of applying for the facility of a scribe, Scribe Photograph in color JPEG image format of size 20 to 50KB is also required. Provide your registration details like name, date of birth, father's name, mother's name, Aadhaar number, state, SSLC/ Matric Roll number. Year or passing and other information as asked. How to apply for Railway Group D Recruitment 2018? 1. Ahmedabad, 2. Ajmer, 3. Allahabad, 4. Bangalore, 5. Bhopal, 6. Bhubaneshwar, 7. Bilaspur, 8. Chandigarh, 9. Chennai, 10. Gorakhpur, 11. Guwahati, 12. Kolkata, 13. Mumbai, 14. Patna, 15. Ranchi, 16. Secunderabad. Candidates can check the vacancy tables of their Railway Recruitment Board in the CEN 02/2018 notification.